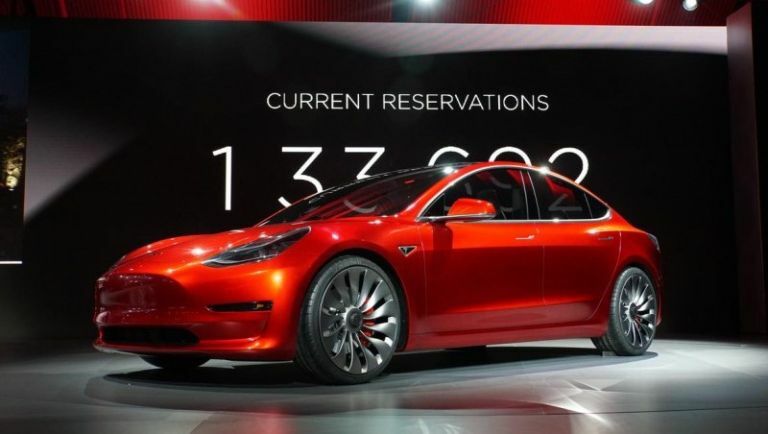 When Tesla revealed the follow up to its previous electric vehicle last week, the Model 3, it expected around a hopeful 125,000 orders or reservations. Now the Californian automotive manufacturer is struggling to meet demand as those numbers double to over 250,000. The Model 3 is a Tesla you can actually afford! Following last week's hype-rich reveal, Elon Musk took to Twitter (as he's know to do) to react to the overwhelming number of orders his firm received over the weekend. Considering Tesla was expecting, "1/4 to 1/2," of the pre-orders it actually received you can understand the manufacturer being a little taken aback with such huge public demand. Tesla also promised to give those that pre-ordered the Model 3 at the reveal event in Los Angeles a special gift along with their reservation. "Token of appreciation for those who lined up coming via mail. Thought maybe 20-30 people per store would line up, not 800. Gifts on order," commented Musk on Twitter. The demand does raise of interesting questions, especially for those at the tail end of the quarter million pre-order list. To bolster the proliferation of EVs, the US government introduced a $7,500 tax credit, but this incentive only applies to the first 200,000 models produced and sold. As to how this will affect those outside this bracket, we're yet to find out, but having to potentially pay more and wait longer doesn't sound like a happy combo.